Modern physicists believe that electrons, photons etc behave like both waves as well as particles. Apparently how these particles behave at any time depends upon how we look at them. For example we can see photons behaving like particles by ‘observing’ how they collide with and eject electrons from the atoms of a metal plate (photoelectric effect). And we can see the same behaving like waves by observing the patterns of interference produced by them in the double slit experiment. So physicists preach that, depending upon how we observe things, the same will appear as a particle at one time and as a wave at other times! Apparently, this duality of behaviour applies not only to elementary particles but also to larger ‘particles’ including atoms, molecules, baseballs and even to planets and stars. But we will realise soon that ‘wave-particle duality’ is actually a myth that is built upon our misunderstanding of wave mechanics. At the most fundamental level, what underlies wave motion is nothing but to and fro motion of particles. And whether it is a particle that moves or a wave that advances, what ultimately happens from the perspective of a receiver or observer is energy transfer. The only difference between the two modes of energy transfer is that – in the farmer, the energy gets carried by just one particle from the source to the receiver but in the latter a ‘series’ of particles do the job. The various phenomena of wave motion (e.g. interference) can be explained purely by particle model. Imagine a player hitting a golf ball that is at rest on the ground. As the golf ball receives energy from the golfer, it goes into motion. Now how this energy gets transmitted from the ball to a distant receiver depends upon the environment (Fig). For example, if there is ‘nothing’ between the ball and the receiver, the ball travels all the way to the receiver and transmits its energy in the ‘particle mode’. But if there are a series of balls in between, the original ball doesn’t travel all the way to the receiver to transmit its energy. Instead energy transmission to the receiver occurs via a series of collisions between the intervening balls i.e. in the ‘wave mode’. From the receiver’s perspective, both scenarios are identical – he receives the same impact at the same time. And same thing can be said using particles or bullets instead of balls. If nothing exists between the particle that is being hit and the observer, the particle moves all the way to the receiver to impart its energy. 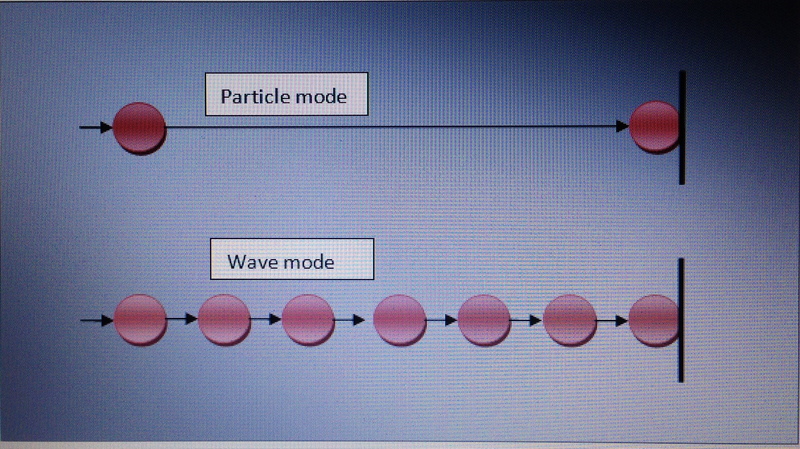 If there is a queue of particles in between, the same energy gets transmitted in the wave manner. But the above depiction represents wave motion at its simplest level. At this most fundamental level of wave motion, the classical wave phenomena like interference, diffraction etc do not get manifest. 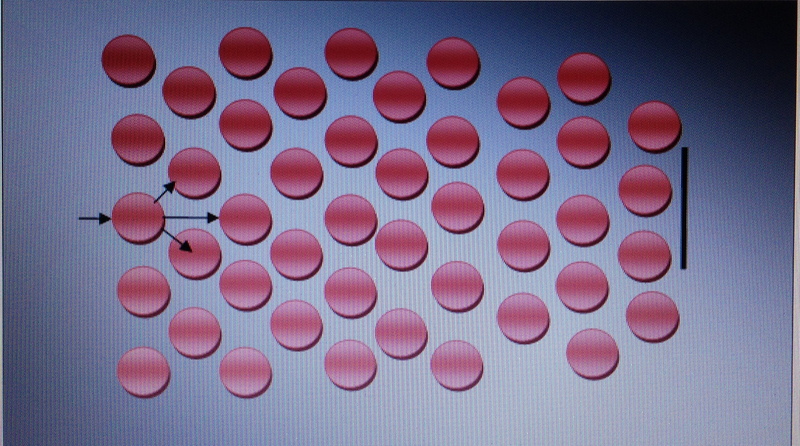 Now imagine that there is a sea of similar particles (not just a queue) in the same environment (see Fig). Obviously the energy of the original particle spreads (or gets scattered) throughout the medium and hence what the observer receives now is only a fraction of the original energy released by the source. In this scenario, we can appreciate all the phenomena of wave motion and we can also explain the results of double slit experiment i.e. how the energy of one particle travels through two separate slits in a screen and produces interference on the other side of the screen. Any substance to act as a medium or to transfer energy in wave mode, it must be deformable as well as elastic. Deformability is the ability of individual particles in a medium to get displaced when external force is applied. This displacement of particles results in what may be called as ‘temporary local deformation’ in the medium – ‘local’ because only those few particles which receive the energy get displaced in the medium while the ‘medium as a whole’ remains at rest. ‘Temporary’ because elasticity of the medium soon restores these particles to their original place and corrects the local deformation. But before being restored, these particles collide and transfer their energy to the neighbouring particles. This results in displacement of the adjacent particles and the process goes on. What an outside observer notices is an ‘advancing local deformation’ in the medium i.e. a wave. It is not difficult to understand why particles in a medium get displaced when hit by some external force. But what force drives the particles back? In other words what is that force that is responsible for the so called elasticity? And where does it come from? We will understand more about this force as we go on but for now let’s simply call this as ‘restoring force’. Depending upon its deformability and elasticity, each medium is suitable for transferring certain types of waves. But we will not go into those details. Now imagine that we ‘hit’ a water molecule deep inside a pond of still water. Keeping in mind our above discussion on deformability and elasticity of media, let’s try describing the motion of the water molecule. To start with, the molecule is at its neutral/ equilibrium point. As it receives energy from the ‘external’ source, it moves along the direction of the force. Then it collides with its neighbours and transfers the energy to them. The elasticity of the medium then restores the molecule back to its equilibrium position. (Of course it ‘overshoots’ several times on either side before it finally settles at the equilibrium point – vide infra). The above to and fro movement of the particle immediately reminds us of a pendulum. So each particle in a medium can be imagined as a tiny pendulum. In other words a medium can be imagined as being composed of tiny pendulums. 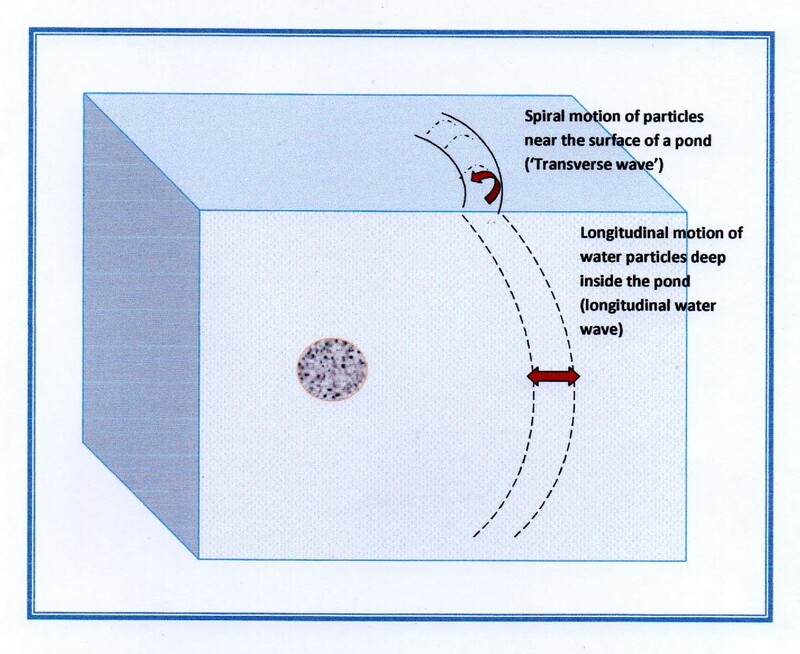 Of course this is not something new – most science students probably are aware of this analogy between particle vibration and pendulum motion. But we are going to unleash many hitherto unknown and ground braking facts about wave mechanics from the above analogy. For those who are not familiar, a pendulum is a ball like object (some call this as a ‘bob’) that hangs from a pivot via a string. When we hit a pendulum, it gets displaced in the direction of the displacing force. This ‘deformability’ or the ability to get displaced when a force acts upon it depends upon the string length. The mass (in other words the inertia) of the bob decides the pendulum’s stiffness or rigidity. The more the stiffness or inertia, the more the force required to displace the pendulum. The recoil force or the restoring force which ‘drives’ the pendulum back to its neutral position comes from gravity. So, while the ‘deformability’ of a pendulum depends upon its string length and pendulum mass, its ‘elasticity’(the force that restores ‘normalcy’) depends upon the strength of local gravity. To understand the above described properties of a pendulum (deformability, stiffness and elasticity) even more clearly, let’s us imagine how a pendulum behaves in various scenarios. First imagine that there is no string – the pendulum can’t be displaced from the pivot point without being ‘broken’. (That means substances that are not deformable get broken when external force is applied. In other words they are fragile). Next, it is not difficult to imagine how mass and stiffness are related – The more massive a pendulum is, the more difficult it becomes to displace it. Coming to elasticity- The stronger the local gravity, the more the ‘elasticity’ of a pendulum i.e. the faster a pendulum returns to normalcy. We can realise this by memorising the pendulum equation which describes the relationship between gravity and period of a pendulum, T=l/g (vide infra). The ‘oscillation’ of a tuning fork can also be explained along similar lines: The length and the stiffness of the prongs decide a tuning fork’s deformability. For a pendulum, we have seen already that gravity provides the restoring force and so is responsible for its‘elasticity’. Obviously there must be some similar restoring force acting upon the prongs of a vibrating tuning fork to account for its elasticity. But what exactly is this force that is responsible for the elasticity of the prongs? In other words, what force drives a tuning fork’s prongs (or a medium’s particles or a guitar’s strings or a vibrating drum) backwards? It is obviously not gravity. We will learn about the fundamental basis of this restoring force in a separate section. When we hit a pendulum or a tuning fork, we know that they don’t stop with just one oscillation but rather they go on oscillating for some time. With each oscillation, their amplitude goes does down (which indicates that they lose a bit of their energy with each oscillation) until they finally come to rest (i.e. settle at the neutral position). For how long a pendulum oscillates depends upon the strength of the initial stroke as well as the environment. For example it oscillates for less time in water medium than in air medium (because it loses more energy in water during each oscillation). In absolute vacuum, it may continue to oscillate for infinite length of time without losing its amplitude. (But of course there isn’t anything like absolute vacuum and my ‘Photonic Ether model’ presented elsewhere proposes that every bit of space is filled with photons). The frequency of a pendulum (f) =1/T. So the period of a pendulum (and hence its frequency) depends upon the string length and local gravity. A pendulum with a long string takes more time for each oscillation and hence oscillates at a lower frequency than does a pendulum with a short string. On the other hand, the stronger the gravitational pull, the faster a pendulum oscillates. As we can see from the above formula, the period of a pendulum is constant for each pendulum in any given location and doesn’t seem to depend upon the amplitude of oscillation (hence indirectly the magnitude of the impact). That means, a pendulum takes the same time to complete one oscillation whether it goes for a shorter or a longer ‘ride’. (Foot note: Of course there is another complex formula that apparently calculates the ‘T’ of a pendulum more accurately: according to this, the period of a pendulum does get prolonged slightly with an increase in the amplitude but only at the extreme limits of oscillation. We will ignore that for now). Obviously if the period of a pendulum (T) is constant, then 1/T also becomes a constant. This implies that each pendulum can only oscillate at one specific frequency in a given location. But we know that this is not the case with particles in a medium: they can vibrate over a wide range of frequencies and can conduct waves of any frequency. Then why not the same is possible for a pendulum? Well, it is possible. The truth is that the above frequency refers to the natural frequency of the pendulum i.e. the frequency of the pendulum when it oscillates in the ground state. We know that every substance or medium has a natural frequency at which its particles vibrate when not under the influence of other vibrating bodies or energy sources. We also know that every tuning fork vibrates at a specific frequency and which is nothing but its natural frequency. Similarly there exists a natural frequency for every pendulum. 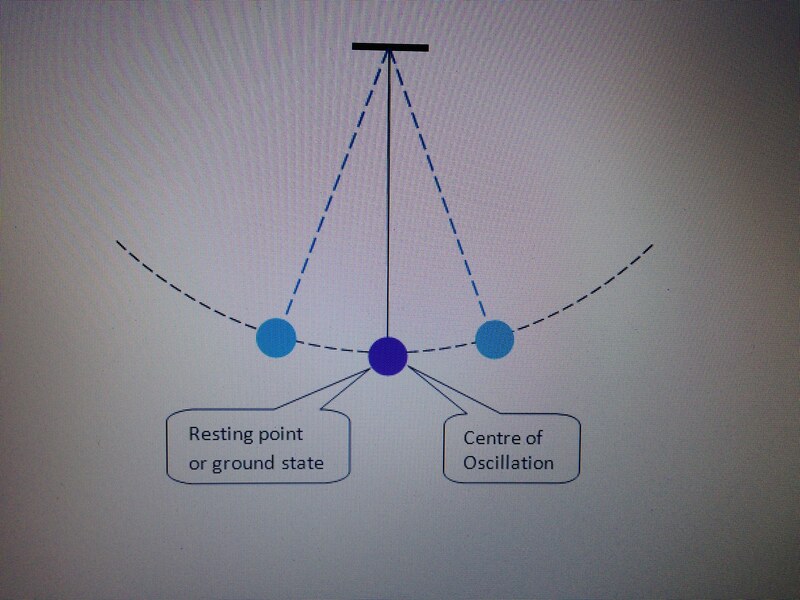 When a pendulum oscillates at its natural frequency, its centre of oscillation corresponds to its resting point i.e. the pendulum goes equally on either side of its resting point. We know that the resting point of a pendulum represents its lowest energy state or ground state, so we may call the natural frequency of a pendulum as its ground state frequency. 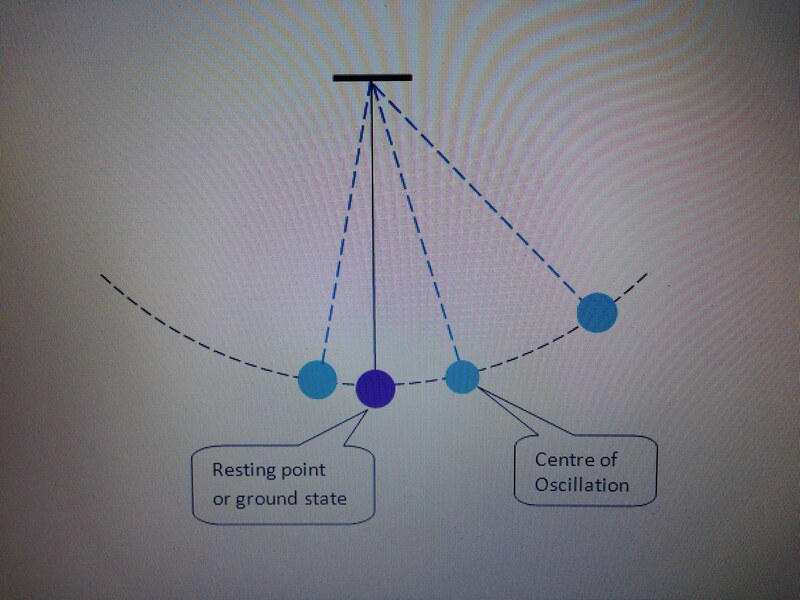 But imagine that we hit the pendulum more than its natural frequency – its centre of oscillation moves away from the ‘ground point’ in the direction of the force applied. And the more the frequency of hits, the farther and higher the centre of oscillation moves from its resting or ground level. Now we can say that the pendulum is made to oscillate in the excited state (‘Stimulated frequency’). Here in the excited state, the period of pendulum ‘T’ becomes shorter and hence the pendulum is able to oscillate at the higher frequency which would otherwise be not possible in the ground state. Same explanation holds true for any vibrating body or particle. So a pendulum can also vibrate similar to the particles of a medium over a wide range of frequencies. In the preceding paragraph we have only explained how a pendulum can oscillate at higher than its natural frequency. But can a pendulum (or a particle in a medium) oscillate at lower than its natural frequency? Obviously a pendulum can’t be made to oscillate slower than its natural frequency. And same thing must be the case with particles in any medium. But we know that media can transmit waves even at very low frequencies despite their higher natural frequencies. So how is it possible for particles with higher natural frequency to conduct waves of lower frequency? To understand this, we have to differentiate here between ‘particle frequency’ and ‘wave frequency’. Particle frequency is the number times a particle vibrates to and fro in a second (irrespective of whether it collides with its neighbour or not). A wave’s frequency depends upon how many times a particle collides with its neighbour and transmits energy to the same each second. A particle need not collide with its neighbour during every oscillation. For example, when a particle oscillates with an amplitude shorter than the inter-particle distance, it doesn’t collide with its neighbour and hence no energy or wave gets conducted. So how many times a particle oscillates with sufficiently large amplitude and collides with its neighbouring particle in a second decides the frequency of the wave being transmitted (And this obviously depends upon the frequency of the energy source). As we believe that particles in a medium behave like pendulums, all that what has been said about pendulums must also be applicable to a medium’s particles. So just like a pendulum, particles in a medium will oscillate at their natural frequency after an initial stroke or energy input. And we must also be able to guess the natural frequency of a substance from its properties (i.e. deformability and elasticity) as is the case with pendulums (string length and gravity). But why is that a pendulum’s or the particles’ amplitude go down with each oscillation? In other words why do they stop vibrating ultimately? In the case of a pendulum, we can imagine that it loses energy to the environment and hence it finally comes to rest. What does it mean for the particles? We will see that soon. The amount of displacement (in other words the amplitude of the pendulum) is decided upon by the strength of the displacing force i.e. the stronger the impact, the more will be the amplitude. Having said that, a stronger force doesn’t increase the amplitude of the pendulum beyond certain point because the length of the string restricts the maximum amplitude (Amax) allowed for any pendulum.The same thing should hold true for the particles as well i.e. deformability of each medium will decide the maximum allowed amplitude (Amax) for its particles. This implies that there must also be a limit to the size of the energy quanta (Q) that any medium can handle or transfer each time. But what happens if we supply bigger ‘chunks’ or quanta of energy than the Qmax? In case of a pendulum, it is possible that the string may get stretched and thus altering the pendulum’s properties or the string may get broken releasing the pendulum from its pivot or if the string is strong, the excess energy may get reflected as the pendulum ‘over turns’ after reaching the Amax. Similarly a medium may get physically altered – temperature of the medium may rise (stretching of string), water may change into water vapour (pendulum breaking away) etc. Imagine the following scenario – A large number of people stand side by side in a row, 1meter distance from each other, to transfer bricks from a truck to a construction site a little far away. Imagine that each person stretches his/her hands towards the left for 0.5meter, receives a brick from the person on the left, moves the hands towards the right (for 1meter) and transfers the brick to the person on the right. The hands then move back to the left and repeat the same again and again. Please note that the hands move for 0.5meter on either side of the midpoint or neutral position, so we can consider that as the amplitude of the hands (A=0.5meter). If the hands move to and fro 10 times per second (f=10), because they cover a distance of 2meters (4xA) during each cycle, they travel a total distance of 20meters in one second. We may call this as the ‘oscillation velocity’ of the hands (V = f x 4A). Obviously the brick gets transferred at the same velocity as that of the hands i.e. 20meters/second. So the velocity of transfer of the brick depends upon the frequency of oscillation of the hands as well as the amplitude of oscillation. Same is the case with waves. We know that a particle moves to and fro as it mediates energy transfer. Each time as the particle moves to the left it receives energy from its neighbour on its left. And as the particle moves to the right, it transfers the same to another particle. The energy quantum advances in the medium as the above process repeats between adjacent particles throughout the medium. So the velocity of a wave is equal to its frequency multiplied by four times its amplitude. The belief that each wave propagates at a constant fixed velocity is only a scientific myth. Because the amplitude of a wave decreases as it propagates in the medium (vide infra), the velocity of the wave must also decrease correspondingly. This is not different from what we see with any moving body or particle in our everyday world – a projectile’s velocity gradually decreases because as the projectile moves, it loses energy to the ‘environment’ (i.e. to the medium) due to the frictional resistance offered by the medium. (Foot note: I have discussed in a different section why Newton’s law of inertia of motion doesn’t hold true in our material universe). If some wave were to travel at a constant velocity throughout, then its amplitude must remain the same throughout which implies that we hear the same intensity of sound and see the same intensity of light however far we may be from the source. The next important point is that the velocity of a wave can’t be the same in all directions. So if someone teaches that a water wave travels at 20meters/sec or a sound wave travels at 330meters/sec, that makes no sense unless we specify in what direction the wave is moving and at what point of time the measurement was taken (as is the case with any projectile). And same is the case with velocity of light. Despite our familiarity with wavelength, it is the most misunderstood concept in wave mechanics. If one can correctly understand wavelength, one will surely realise why relativity and quantum mechanics are wrong. So far we haven’t come across wavelength anywhere in our discussion on wave motion, and not even while deriving the velocity equation. But we know that wavelength is so important that without wavelength we can’t talk about waves or wave motion. 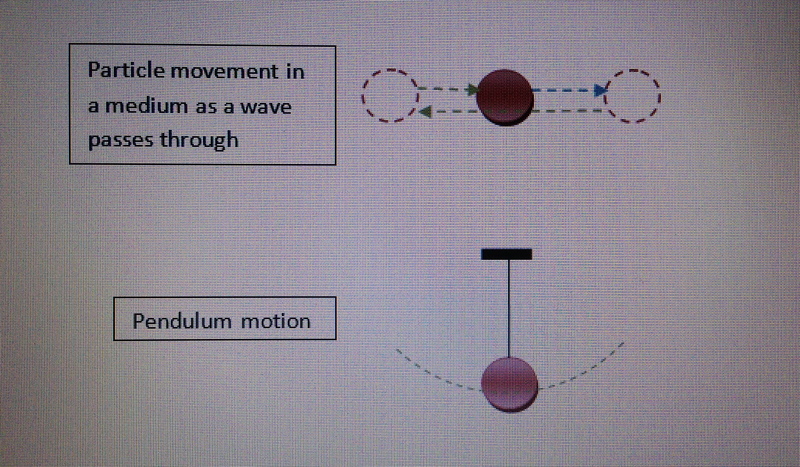 So where does it come in our ‘particle-pendulum’ model of wave motion? And, since our school days we are all familiar with the wave equation ‘v=λf’ which tells us that the velocity ‘v’ of a wave is equal to the product of its wavelength ‘λ’ and frequency ‘f’. But we have just seen that the velocity of a wave = 4 x amplitude x frequency. Obviously there is major discrepancy between what we have deduced logically and what we have been taught traditionally. We will soon realise that it all stemmed from our physicists’ misunderstanding on wavelength. We know that wavelength is the distance between two consecutive peaks or consecutive troughs of a wave. But what does it mean for an oscillating pendulum or an oscillating ‘particle pendulum’ in a medium? For any oscillating pendulum, we know what ‘amplitude’ means – it is the amount of displacement of the pendulum from the resting point during each oscillation. Similarly we know what ‘frequency’ means – it is the number times a pendulum oscillates in a second. But how can we define ‘wavelength’ for a pendulum? It may sound weird, but if we have to believe in the analogy between wave motion and pendulum motion, we will have to believe that there must be something called wavelength for pendulums also. And if we can explain that for pendulums, we can apply the same to the situation of waves. Hopefully that should help us better understand about wavelength in general. How many people will bear the weight of the object at any time depends upon ‘contour’ or type of the object and the efficiency of the people. It may be that an object needs just one or two persons to bear its whole weight or it may require 10 persons. With this background in mind, we can now describe what wavelength means for the ‘cylinder wave’: How many people carry each steel cylinder at any time represents the wavelength of the ‘cylinder wave’. So wavelength is something that indicates the distribution of the object’s weight amongst the people in the row. In other words it is a measure of spread of the object’s weight in the space as it travels in the ‘medium of people’. If the weight of the object is borne by just one person at any time, its wavelength may be considered as ‘one person wide’ (e.g. brick wave). And if the weight of the object is borne by say 10 people in the row, then its wavelength becomes 10 times longer (e.g. rod wave or cylinder wave). And same is the case with energy waves. When a large quantum of energy is delivered to a medium, instead of a single particle taking up the entire burden of energy transfer, a ‘row’ of particles ‘share’ the burden of carrying the energy quantum (just like how each log is supported and carried by 5 people at any time). Wavelength indicates the extent of spread of the energy quantum in the medium. In other words it is a measure of distribution of the energy quantum amongst the particles of the medium at any point time. So how many particles take part in carrying the energy pocket at any point of time decides the length of a wave. The more the number of particles that take up the energy quantum of a wave, the longer becomes its wavelength. On the other hand, the amount of energy carried by each particle decides the amplitude of the wave. The more the quantity of energy carried or ‘held’ by each particle in the group, the more becomes the amplitude of the wave. So while transferring heavy objects, rather than one individual, a group of individuals bear the weight of the object at any point of time and each individual in the group bears only a bit of the total weight of the object. Obviously the sum of the weights borne by all the individuals in the group must be equal to the total weight of the object. Depending upon how the weight is delivered i.e. whether it is in the form of a solid steel ball of 10kg or in the form of a long wooden log of 10kg, and the efficiency of the people, the same weight may be borne by just few individuals or a large number of individuals. That is to say, the wavelength of a travelling object depends not only upon the weight of the body but also on how the weight is delivered to the crowd. And the velocity of transfer of the wooden log doesn’t depend upon its length, it just depends upon the to and fro motion of the individuals (i.e. frequency and amplitude). Wavelength of a pendulum wave: Imagine a row of pendulums, arranged at a little distance from one another. We can initiate a pendulum wave by hitting the first pendulum and the wave travels along the row of pendulums. The number of pendulums that come in contact with each other as the wave travels along the row of pendulums gives the wavelength of the pendulum wave. So obviously wavelength doesn’t make sense to an isolated pendulum or a particle, it only exists for a wave travelling in a medium (of pendulums or particles). But where does this ‘lost’ energy go? We know that energy can’t be destroyed or created. It can only be transferred between particles or bodies. So as the particle or the pendulum moves it must be transferring its energy to something in the background – we may call this as the ‘interstitium’ which in other words is the ‘intervening environment’ between particles. We have noted elsewhere that our entire universe is permeated by a sea of photons or Ether. So the interstitium of all the substances or media may be imagined as being filled with Ether. But by means we can consider this Ether as the most fundamental stuff – it is very likely that an even more fundamental stuff fills the space between the Ether particles and so on. For description purpose, let’s introduce here two terms – ‘reference medium (RM)’ and ‘background medium (BM)’. The particles of the reference medium lie suspended in the background medium. These terms are obviously relative. So during wave motion, not all the energy gets transmitted via the reference medium – part of that gets dissipated to the background medium and travels in a more fundamental form in the background medium. It is likely that energy travels much faster in the background medium than in the reference medium. For example, when a tuning fork vibrates, its energy gets transmitted via air particles in the form of sound waves. But during the to and fro motion, part of the air particles’ energy dissipates into the background Ether medium, and travels in the form of the so called electromagnetic waves (it makes more sense to call them as Ether waves). Because of the energy loss in transit or the energy dissipation into the background, the energy quantum of a wave slowly decreases as a wave advances (and so is its amplitude). Of course the loss of amplitude of a wave probably occurs more due to energy spread in the reference medium (scattering effect) than the loss into the background medium. Obviously, the amplitude of a vibrating particle must be more than the inter-particle distance for effective wave motion or transfer of energy via the reference medium. But what happens if we hit a particle with only a tiny force and make the particle vibrate with an amplitude shorter than the inter-particle distance? Obviously the particle loses all its energy to the background medium, of course only a tiny bit during each oscillation, and this energy gets conducted in the background medium. Though we describe two types of waves traditionally i.e. transverse and longitudinal, in reality all waves are longitudinal waves and there is nothing called a transverse wave. And unlike what we have been taught in physics classes, the particles in a medium always vibrate parallel to the direction of propagation of the wave and never in the ‘transverse’ direction , though they ‘vibrate’ in a spiral fashion near the surface of the medium for reasons explained elsewhere. 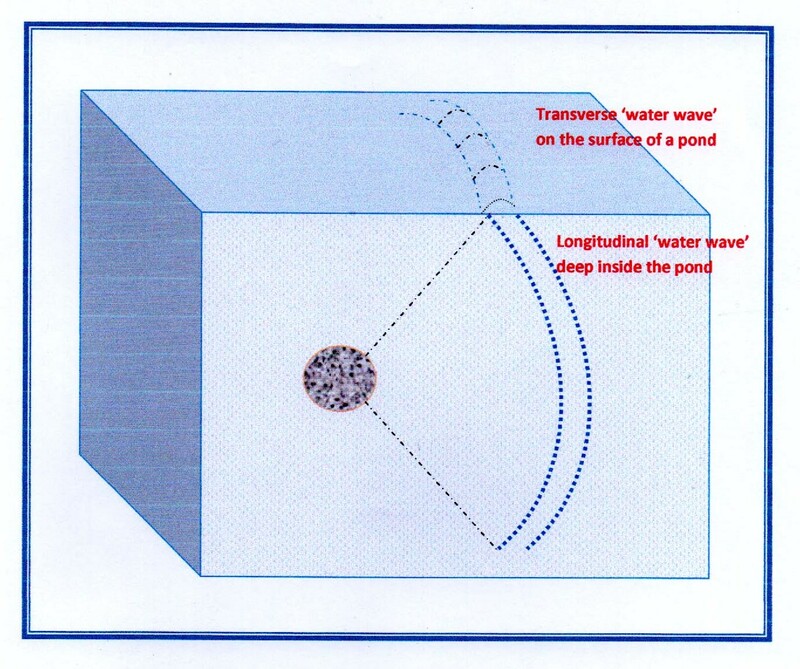 By moving a paddle to and fro deep inside a pond, we actually produce longitudinal waves under the water surface. The same thing happens when a tuning fork vibrates under water. As these waves get conducted to water surface, they appear as transverse waves. So what we observe as transverse waves is only a surface manifestation of the underlying longitudinal waves. So the ripples or the so called water waves that we observe on the surface of a pond or a sea do not actually represent a complete wave. A wave is better described as a propagating 3 dimensional phenomenon in a medium. A spherical point source produces a wave that looks something like a convex mirror at the beginning. As the wave propagates/ expands, it elongates more along its axis and becomes more like a conical mirror. And on the receding side, the mirror tries to close on itself.